United Fire & Rescue was formed in 1994 when the local fire departments from Baldwin, Hammond, and Woodville consolidated. Each of the three villages combined their resources of fire stations, firefighter personnel, fire apparatus, and firefighting equipment to become one unified responding group of volunteers to answer emergency calls in the largest fire service area within St. Croix County. 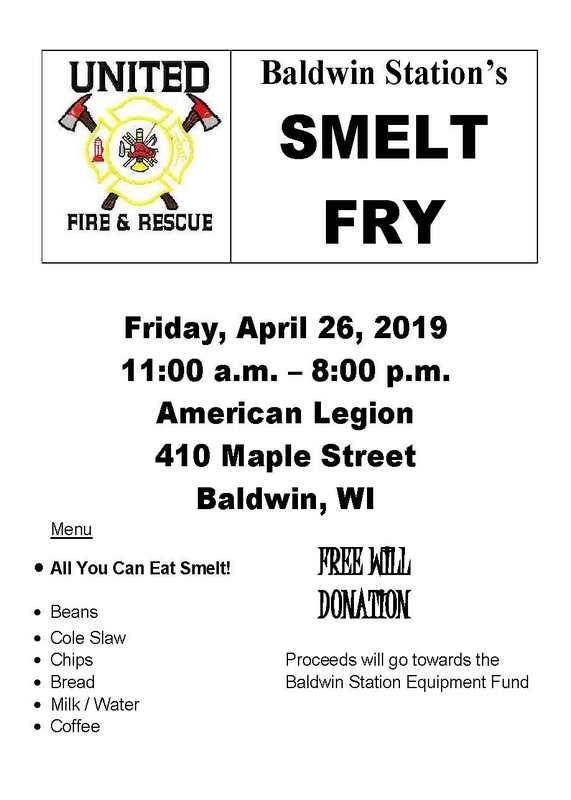 United Fire & Rescue District provides coverage in the Villages of Baldwin, Hammond, Woodville, and Wilson, as well as the outlying Towns of Baldwin, Cady, Eau Galle, Emerald, Erin Prairie, Hammond, Pleasant Valley, Rush River, and Springfield. Each member community has representation on the United Fire & Rescue Board of Commissioners. 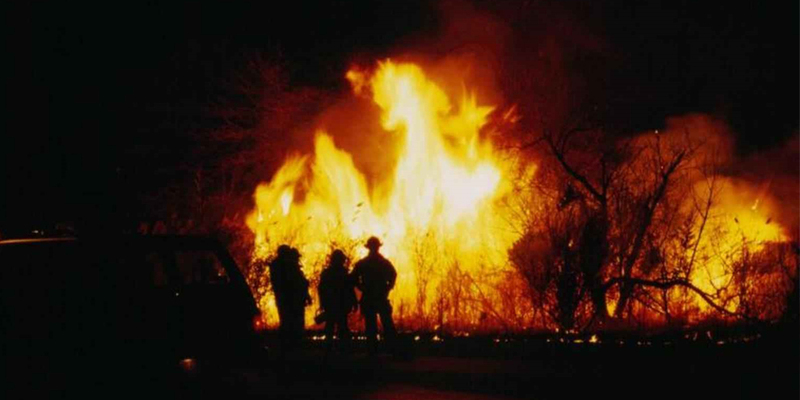 United Fire & Rescue responds to structure fires, grass and wildland fires, hazardous material incidents, traffic accidents, as well as other kinds of accident and emergency rescue scenes. United Fire & Rescue’s coverage area is approximately 180 square miles, made up of over 60 miles of federal and state highways, various industries and agriculture, and is home to approximately 14,000 residents. 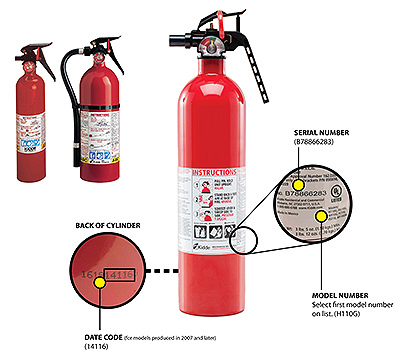 United Fire & Rescue has automatic response agreements with two neighboring departments and also participates in a multi-county mutual aid system to support neighboring communities whenever the need arises. Approximately 80 firefighters – dedicated volunteers - who answer approximately 200 calls per year in addition to monthly meetings and monthly training schedules. Members receive initial training, as well as ongoing training, coordinated through the Wisconsin Technical College System that is in accordance with federal and state requirements. Each station houses and maintains an Engine/Pumper, a 3200 gallon Water Tender/Tanker, a Brush Truck with a Wildland ATV equipment, extrication and rescue equipment, ice rescue equipment, and thermal imaging equipment. The district is also equipped with a 78’ aerial truck, a 50’ Telesquirt truck, an Air Van for filling SCBA air bottles on-site at an emergency scene, a reserve Engine/Pumper, and Confined Space rescue equipment. Fourteen pieces of fire apparatus. Three stations. One department. United and proud to serve. We are, United Fire & Rescue District. Looking to become a member of United Fire & Rescue? Becoming a volunteer firefighter is a very rewarding and valuable way to serve your community. Different people volunteer for different reasons. Many enjoy helping others in a time of need. Some feel it’s their obligation to serve their community…a call of duty. Some see the volunteer fire service as variety to their everyday work. Some love the excitement and adrenaline rush. Most enjoy the camaraderie and team atmosphere of working towards a common goal for the greater good. Whatever motivates you to volunteer, others in need will benefit from your dedication and service. It takes both physical and mental strength to make this kind of commitment. While many join with the desire to help and the willingness to put themselves in harm’s way, the ability to do so safely and effectively, as well as the confidence to do so in emergency situations, needs to be learned. Members receive both initial and ongoing training from local training agencies through the coordination of Wisconsin Technical College System. Volunteering with United Fire & Rescue could be one of the most important decisions you may make. We hope that you give this decision the time and serious consideration it deserves, and decide to join our ranks. If you’re interested in serving your community and committed to offering your time and abilities when someone calls 911, fill out the attached application and call the district office at 715-684-2954 to setup a time to meet with a chief. 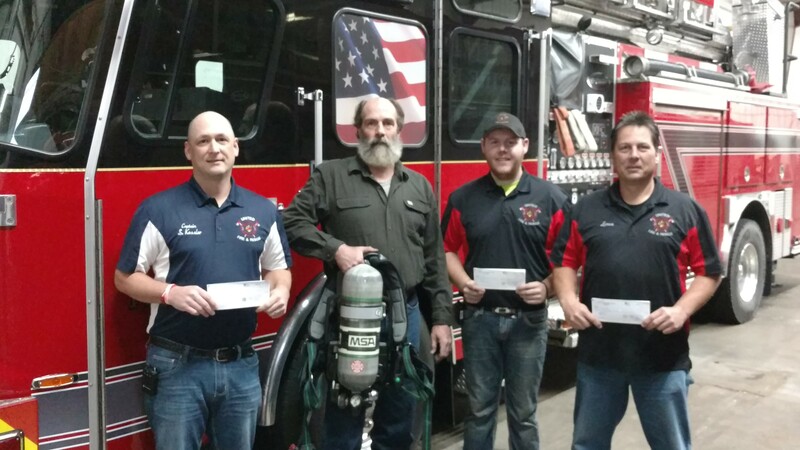 Pictured above is Sean Kessler, Colin Bol and Lance Schmit presenting United Fire & Rescue Board President Paul Hueg with checks toward replacing the department’s 42 SCBA air packs. Each station organizes various fundraising events throughout the year for new equipment, and thanks to the support of the community, a total of $60,000 was contributed toward this $315,000 project. United Fire & Rescue is very appreciative of the continued support of the community, as well as the fundraising efforts of the members. 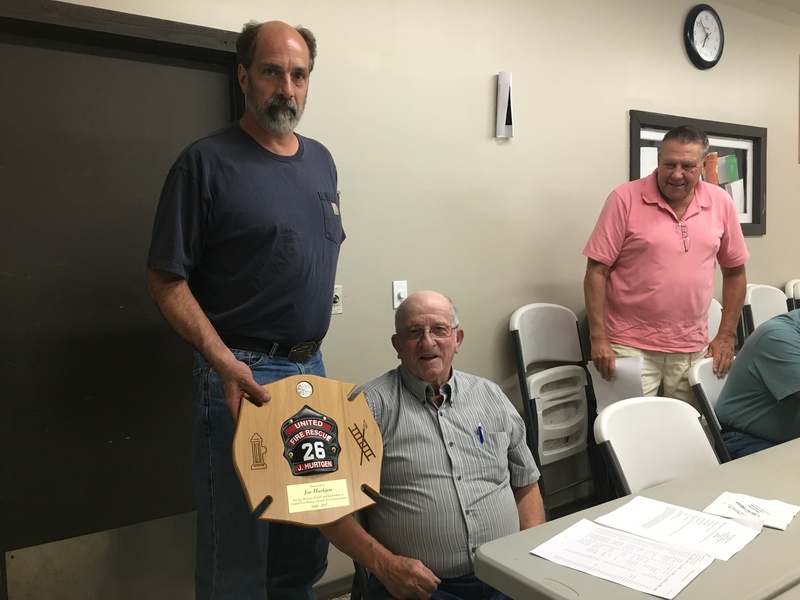 At the August United Fire & Rescue Finance Committee, Joe Hurtgen was acknowledged for his 26 years as Commissioner on the Fire District’s Board of Commissioners. Joe, presenting the Town of Baldwin, recently retired as Town Chairman. Presenting him with a plaque is Paul Hueg, United Fire & Rescue District Board of Commissioners President. Looking on is District Chief Reid Berger.